Yes. That’s right. 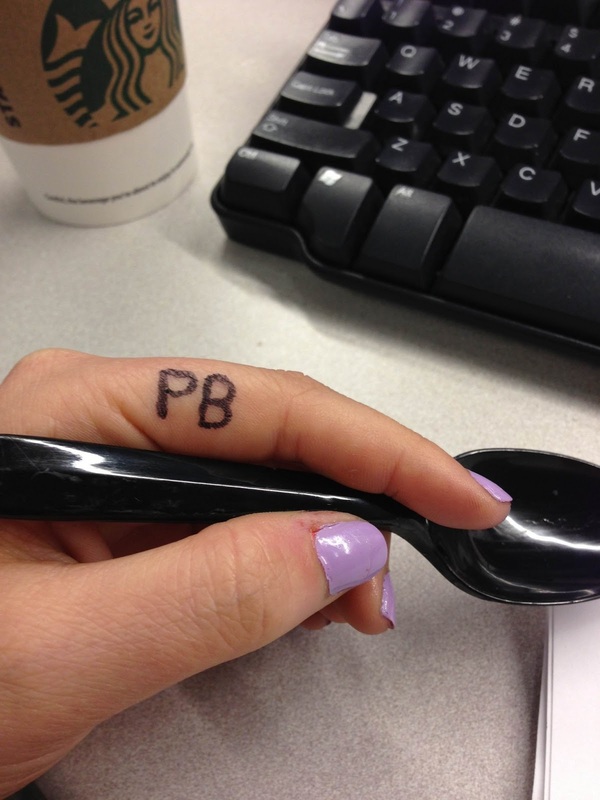 It says PB on my finger, in black permanent marker. One of my biggest challenges when it comes to my self-management is remembering to bolus before my meals. I either remember halfway through my meal, when I finish, or in a few instances, a half an hour after I’m done. I’ve talked about this in an older post and how pre bolusing feels like I am giving up some of my control. However, I know that if I can remember to give my insulin before I eat, I can drastically cut down on my post meal bg spikes. Sometimes it takes hours for these spikes to return to a normal level. I know that all of this will ultimately help to lower my A1c and hopefully finally get me from being in the 7’s to the 6’s. I know what I have to do, now it’s just remembering to do it. Clearly that’s easier said than done. This habit of bolusing midway or after eating is so ingrained that I am truly struggling to remember to pre bolus. I’ve tried to think of a few ways to help remind myself. I don’t really eat at the same time everyday so setting an alarm on my phone wouldn’t really work. Plus, I don’t always have my phone visible while at work. Ultimately I decided to try something different. I would give myself a “cue to action.” A visible reminder of a behavior that I want to change. I figured if I wrote PB on my finger, I would be sure to see it. After all, I use my hands to eat, how can I miss black bold letters written on my hand? Well, apparently I can. I’ve had mixed results with this pseudo experiment. I do see the PB written on my hand, unfortunately it’s not at times when I’m about to eat. It’s when I’m sitting at my desk working on my computer. When I’m stuck in traffic driving to and home from work. Or when I’m using my phone. Of the few days that I have written PB, I have remembered to pre bolus for only a few of those meals. A few times I remembered, but wasn’t able to because my bg was low. But there were a couple meals that I still completely forgot. I got so caught up in my conversations and food that the thought completely escaped me. It’s more work, but in this case, the benefit is definitely worth the extra effort. I have this same problem! I have always tried to find ways to remember like setting alarms in my pump or phone but it never seems to work for me. I will have to try writing it down. Thanks for sharing! Interesting, I've struggled with the inverse problem. When I was on shots, I used to forget whether or not I'd bolused before a meal. The pump has saved me from many an accidental double-PB because it keeps a record of every bolus! Do you bring your lunch to work? What if you put a note on your food container? Ha! This is brilliant! And almost works! PB'ing is such a hard thing to remember. Life just moves too fast sometimes, and it's hard being scheduled so rigidly ('cause if your meal gets delayed you're in deep water). There has to be a way to figure this out though – keep trying!